Forge an Unfaltering Faith in the Fiery Trials of Life! 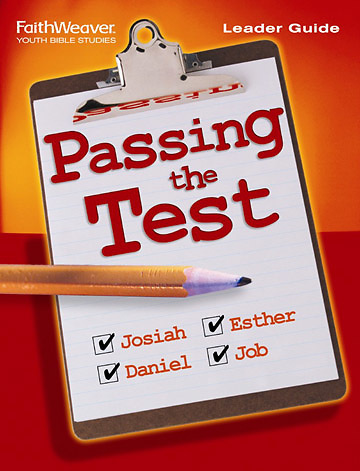 Turn potentially faith-busting tests, trials, problems, and hardships into faithbuilders! In Passing the Test, students will learn from great faith heroes. Josiah. Daniel. Esther. Job. These and other Bible people stood steadfast in faith through problems, tests, tragedies, and catastrophes. They emerged from potentially faith-shattering trials with refined, rock-solid faith. Help "toughen" your teens' faith to stand firm in the face of life's challenges! FaithWeaver Bible Curriculum provides powerful lessons that explore Bible truths and small group discussions that tackle tough questions. Reproducible handouts for each of the 13 sessions include a Taking It Home piece to encourage discussions between parents and youth.